The quaint northwoods town of Boulder Junction Wisconsin is clearly one of the most famous tourist and fishing destinations in Wisconsin. Nestled in the middle of the 240,000-acre Northern Highland-American Legion State Forest, the region is known throughout the Midwest for its crystal-clear waters and outstanding fishery resources. Tourism is the driving force in this region with most spring, summer, and fall visitors interested in the diverse fishery available. Walleye, muskie, smallmouth bass, largemouth bass, northern pike, trout, crappie, bluegill, and more are available in the waters that range from a "lost" glacial pothole in the middle of the forest to the glistening expanse of Trout Lake. Open water action begins on opening day in May and continues until ice-up, usually in mid-November. Ice fishing is popular during the winter months with panfish, walleye, and northern pike favorite quarry. 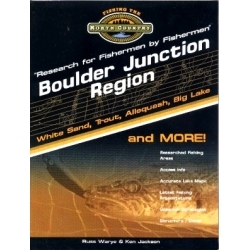 For Midwestern anglers the lake names associated with Boulder Junction are among the best in the North Country. They include Trout, Big, Big Muskellunge, White Sand, Upper Gresham, Allequash, Boulder, Wildcat, High, Fishtrap, and much more. The community has the registered trademark "Musky Capital of the World" - a strong indicator of the interest that fishing (and muskie fishing) holds within the area. A national outdoor magazine as well as a regional periodical has named Boulder Junction as one of the best fishing destinations in the country. Some of the lakes included in this book are: Allequash, Allequash Springs, Manitowish Chain, Big Lake, Big Gibson, Big Kitten, Big Muskellunge, Boulder, Crystal, Day, Diamond, Edith, Elizabeth, Emerald, Esxanaba, Falison, Firefly, Fishtrap, Grassy, High, Jag, Johnson, Jute, Lake 10/14, Little Crooked, Little Gibson, Little John, Little John Jr., Little Rice, Lost Canoe, Mann, Maple, Middle Gresham, Nebish, Nichols, Nixon, Oswego, Pallette, Palmer, Round, Rudolph, Rush, Sime, Sparkling, Spruce, Street, Tenderfoot, Trout, Upper Gresham, White Sand, Whitney, Wildcat, Wildwood and Wool lakes.